Right-hander Dustin Moseley has recovered from shoulder surgery that sidelined him for the majority of the 2012 season and all of 2013, and he will audition for teams next Tuesday, MLBTR has learned. Now 32 years of age, Moseley hasn’t appeared since injuring his shoulder in his lone start of the 2012 season. He originally underwent shoulder surgery late in what had been a solid 2011 campaign before re-injuring the joint and undergoing a second operation to repair his labrum and rotator cuff. With the Padres in 2011, Moseley tossed a career-high 120 innings and posted a 3.30 ERA with 4.8 K/9, 2.7 BB/9 and a 49.5 percent ground-ball rate. Moseley, a client of Frontline Athlete Management, has never been one to light up radar guns (career average of 89.3 mph on his fastball) or miss many bats (career 5.0 K/9), but he’s averaged just 2.9 walks per nine innings in his career and posted a strong ground-ball rate of 47.8 percent. Overall, the former supplemental-round draft pick has a 4.67 ERA in 358 1/3 innings between the Angels, Yankees and Padres. He was originally drafted by the Reds with the 34th pick in the 2000 draft as compensation for losing Juan Guzman to free agency. The Padres have been talking to right-hander Brett Myers, according to Myers' agent. San Diego would use Myers as a starting pitcher, which is Myers' preferred role after spending 2012 coming out of the bullpen for the Astros and White Sox. The Tigers are reconsidering trading Rick Porcello, who has drawn attention from the Padres and several other clubs since Detroit re-signed Anibal Sanchez. If Porcello is available, Center feels it would take more than a rumored trade package of Luke Gregerson and Jesus Guzman for the Padres to acquire the right-hander. It's a "gamble on both sides" for Chase Headley and the Padres that there are apparently no extension talks taking place between the club and the third baseman. Headley is under team control for two more years, but a repeat of his 2012 numbers could make him too expensive for the Padres to lock up. Everth Cabrera has drawn trade interest but most clubs (including the Padres) aren't sure if he is capable of being an everyday shortstop. Center notes that San Diego has been shopping "several" of its middle infielders this winter. The Padres are "actively seeking" starting pitching but aren't going to be forced into making a bad signing just for the sake of adding an arm to the rotation. Between Porcello, Shaun Marcum and Joe Saunders, Center lists Marcum as the most likely of the trio to be a Padre in 2013, followed by Saunders and Porcello in that order. The Padres won't be adding another outfielder as they already have several options on the roster. Center doesn't expect the Padres to have a $100MM payroll within the next few years, even adding an "if ever" to the idea. The Padres want to bring back Dustin Moseley and Tim Stauffer on minor league contracts. The two pitchers elected to become free agents in October following injury-plagued 2012 seasons. Center hasn't heard of the Padres having any interest in Carlos Zambrano. The Padres announced that right-handers Dustin Moseley and Tim Stauffer have cleared outright waivers and have elected to become free agents, reports the San Diego Union-Tribune (Twitter link). Moseley was enjoying a career-best year in 2011 (3.30 ERA in 20 starts) before missing the last two months of the season after dislocating his left shoulder while swinging a bat. The injury bug followed Moseley to this season, as he was limited to just one start in 2012 after undergoing surgery on his throwing shoulder. 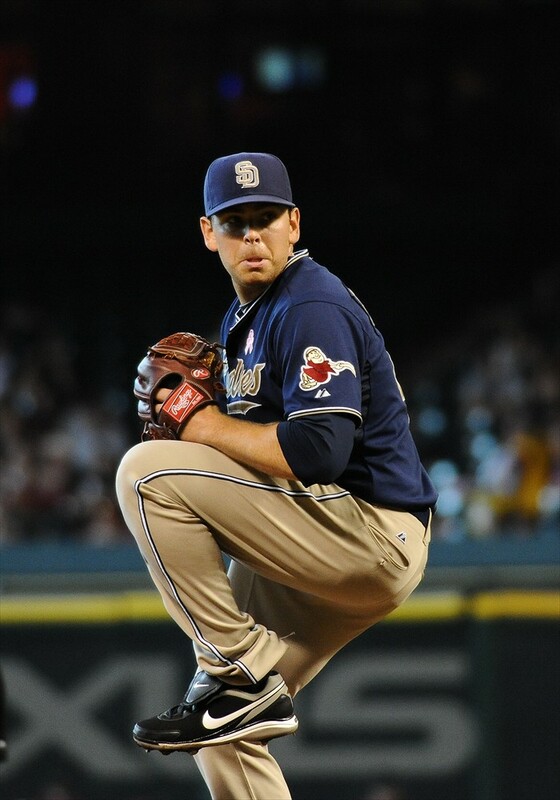 Stauffer posted a 1.87 ERA as a starter and reliever in 2010 and enjoyed a solid full-time return to the rotation in 2011, when he was the Padres' Opening Day starter and posted a 3.73 ERA, a 2.42 K/BB ratio and a 6.2 K/9 in 31 starts. Like Moseley, Stauffer was limited to just one start in 2012 due to injury, in this case elbow problems that required surgery in August. Stauffer tells the Union-Tribune (Twitter link) that he would like to return to San Diego, though it would have to be on a minor league contract. Both pitchers were entering their third year of arbitration eligibility and both were seen as likely non-tender candidates by MLB.com's Tim Dierkes in his look at the Padres' arb-eligible players. Matt Swartz projected Moseley to earn $2MM in 2013 while Stauffer was on pace to earn $3.2MM. The Padres won 90 games in 2010, but they fell back into the NL West cellar in 2011. They changed GMs this offseason and traded ace Mat Latos to the Reds for a package of three young players and Edinson Volquez. New GM Josh Byrnes also bought low on Carlos Quentin and Huston Street, but a lot will have to go right for San Diego to return to contention this season. ESPN.com and Baseball Prospectus agree that the Padres have the best farm system in baseball, and they're going to have a prospect-heavy Triple-A rotation led by three of their ten best minor leaguers: Casey Kelly, Robbie Erlin, and Joe Wieland. Kelly came over in the Adrian Gonzalez trade while both Erlin and Wieland came from the Rangers in the Mike Adams deal. With that kind of talent waiting in Triple-A, Byrnes figures to be able to shop a starter or two for more young players at midseason. The 29-year-old Tim Stauffer (pictured) was San Diego's Opening Day starter last season. He finally made it through his first full season as a big league starter in 2011, eight years after being the fourth overall pick in the draft. He pitched to a 3.73 ERA in 185 2/3 innings spread across 31 starts, relying on ground balls (51.8%) and control (2.57 BB/9) rather than strikeouts (6.20 K/9). Stauffer did appear to hit a bit of wall in mid-August and finished the season on the shelf with arm stiffness, but he's healthy now and ready to go. Dustin Moseley, 30, was enjoying a bit of a breakout year in 2011 before dislocating his left (non-throwing) shoulder swinging a bat in late-July, which ended his season. Before the injury he'd pitched to a 3.30 ERA in 20 starts (120 IP). Like Stauffer, he's a ground ball (49.5%) and control (2.70 BB/9) guy, not a strikeout guy (4.80 K/9). Also like Stauffer, Moseley is healthy now and will begin the season on time and in the rotation. Stauffer and Moseley aren't the biggest of names, but they'll have plenty of trade value if they carry their 2011 performance over into 2012. The former will earn $3.2MM this year and the latter just $2.0125MM, plus both guys will remain under team control as an arbitration-eligible players in 2013. With expensive hurlers like Joe Blanton ($8.5MM) and John Lannan ($5MM) highlighting the current pitching trade market, Stauffer and Moseley could look very attractive at their salaries come June and July. The Padres have plenty of young pitching on the way, so they should be able to replace a starter if they make any trades this year. They can always count on Petco Park to help their pitchers perform a little better than they probably should as well. Both Stauffer and Moseley are unspectacular but effective when healthy, and we've seen similar pitchers like Jake Westbrook and Ted Lilly fetch nice returns at the deadline in recent years. The San Diego duo is both younger and cheaper, and new ten-team playoff system could mean more clubs will be in contention and looking for rotation help this summer.